An international team of scientists has discovered a potentially habitable super-Earth orbiting a nearby star — the new best candidate to support liquid water and, perhaps, life as we know it, the scientists say. 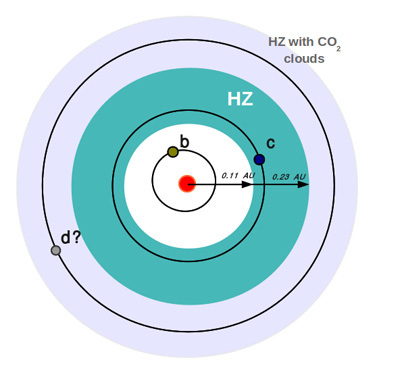 With an orbital period of about 28 days and a minimum mass 4.5 times that of the Earth, the planet orbits within the star’s “habitable zone,” where temperatures are neither too hot nor too cold for liquid water to exist on the planet’s surface. The researchers found evidence of at least one and possibly two or three additional planets orbiting the star, which is about 22 light years from Earth. The team includes UC Santa Cruz astronomers Steven Vogt and Eugenio Rivera and was led by Guillem Anglada-Escudé and Paul Butler of the Carnegie Institution for Science. Their work will be published by Astrophysical Journal Letters. 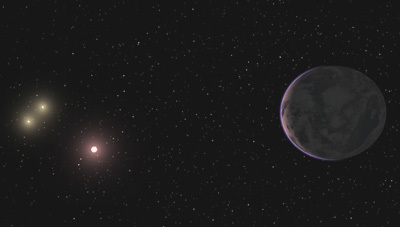 The host star, called GJ 667C, is a member of a triple-star system (GJ 667AB) and has a different makeup than our sun, with a much lower abundance of elements heavier than helium, such as iron, carbon, and silicon. This discovery indicates that potentially habitable planets can occur in a greater variety of environments than previously believed. GJ 667C is an M-class dwarf star. The other two stars in the triple-star system are a pair of orange K dwarfs, with a concentration of heavy elements only 25 percent that of our sun’s. Such elements are the building blocks of terrestrial planets, so it was thought to be less likely for metal-depleted star systems to have an abundance of low-mass planets. The planet (GJ 667Cc) has an orbital period of 28.15 days and a minimum mass of 4.5 times that of Earth. It receives 90 percent of the light that Earth receives. However, because most of its incoming light is in the infrared, a higher percentage of this incoming energy should be absorbed by the planet. When both these effects are taken into account, the planet is expected to absorb about the same amount of energy from its star that the Earth absorbs from the sun. The team found that the system might also contain a gas-giant planet and an additional super-Earth with an orbital period of 75 days. However, further observations are needed to confirm these two possibilities. “With the advent of a new generation of instruments, researchers will be able to survey many M dwarf stars for similar planets and eventually look for spectroscopic signatures of life in one of these worlds,” said Anglada-Escudé, who was with Carnegie when he conducted the research, but has since moved on to the University of Gottingen.